But how do you artfully display them, without reducing your swanky wedding reception to what looks like a lollipop stand? I think this display is absolutely fantastic. When I espied it on Pinterest, I just KNEW I had to feature it. Rows and rows and rows of pastel cakepop goodness, topped with fabulous, frilly peonies. Love! LOVE!! What are your thoughts? 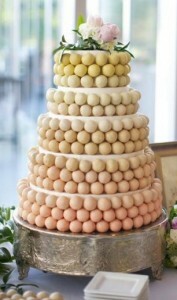 Could you really forego a traditional wedding cake in favor of a new-fangled approach like cake pops? Or is this the stuff of an adorable wedding shower dessert table in your opinion? Not sure if they are the creators but I saw the same picture in the Battlefield mall for A Bit O’ Cake Bakery in Springfield, MO. Love the idea! Thinking about doing this for our wedding. Renee, Thanks so much for the info! I think it’s a lovely idea, and I’m sure any cake pop maker could come up with something similar. Congratulations and good luck!